Focusing on a Ford and a Honda you Really "Odyssey"
"Fun to drive" may not be everyone's priority, but if an everyday vehicle also has some of that factor built in it can certainly make life with it more pleasant. Such is the case with a couple of 2009 vehicles I drove recently that, while nowhere near "all new" or "all fun" are still worth a look if you're shopping for a compact sedan or minivan. The sedan, the Ford Focus, is a pleasant and well-equipped, if "style-challenged" vehicle that performs better than you might expect considering its niche near the lower end of the market. 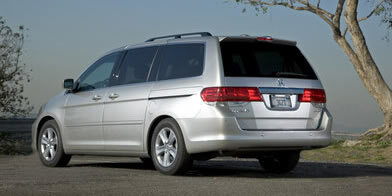 And the minivan, the 2009 Honda Odyssey, is about as nice a way to haul people and their stuff as you can get. I drove both vehicles last year, but it's always good to have a chance for a second opinion. This time, my Focus was the same SES trim level I drove in 2008, while the Odyssey featured a more up market trim level that, if nothing else, helped me understand why people check off the options boxes when they're shopping at the dealership. As the only U.S.-based manufacturer to avoid falling victim to the socialist hordes so far, Ford Motor Company now has a softer spot in my heart than it did a few months ago – not that I had anything against the company before. But now it's the last of the traditional "Big Three" whose destiny is still in its own hands and that makes for a very interesting situation. And good luck to them! The Focus is a very nice little car, but it really needs a dose of style to make it more competitive in a marketplace that includes such entries as the Mazda 3, VW Jetta and Honda Civic. 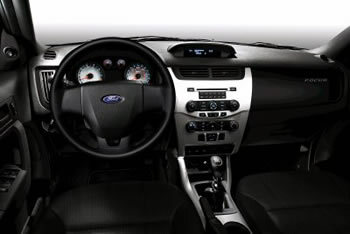 Ford appears to be listening; their media website says changes to the SES version of the 2009 Focus "inspired by customer feedback" include new fascias front and rear, a new roof-line spoiler and standard 17-inch aluminum wheels. It isn't enough to move the Focus from the dumpy to drop dead gorgeous, though. Hopefully the next generation will do that, because the exterior is the car's weakest link; once you move inside and can no longer see the sheet metal it's actually very nice. One thing that endeared the '09 Focus to me more than last year's was the fact that this year I got to drive it with the five speed manual transmission, which not only adds substantial fun to the experience, but which also lets you take best advantage of the extra horsepower and quicker acceleration Ford says it has coaxed out of the manual-equipped version – all, apparently, without compromising the car's 35 mpg fuel economy rating. Focus features a 2.0 liter, dual overhead cam Duratec inline four cylinder engine rated at 143 horsepower with the manual transmission and 140 with the four-speed automatic. A 130 horsepower version is also available, that particular Focus being a "Partial Zero Emissions Vehicle (PZEV)" and therefore capable of kissing up to the greenies. I liked the combination of the adequate power coupled with the five speed stick, which shifts very nicely and is connected to a light clutch. The stick is mounted just a tad too far forward on the center console to be perfect, but that's a very minor quibble. The seats of my tester were fabric and attracted cat hair, though not as badly as some vehicles I've driven, which almost seem as if they break into our house and rub themselves all over the cats when we're asleep. The front seats are comfortable, but need a little better side bolstering; they're pretty good for this class of car, but you do tend to slide around a bit when the cornering gets interesting. The instrument panel and dashboard are reasonably attractive – with black on silver gauges and a little digital display. It also features an upward-pointing arrow that's the car's way of yelling at you to upshift for optimal gas mileage, a bit of nagging you may or may not like. If you don' t like it, a little duct tape will get rid of it. The sunroof slides open and closed with one touch, but the tilt feature doesn't close with one touch. And only driver's window has a one touch down feature, and it doesn't go back up again that way. I was impressed with the Focus' large, deep trunk. It's cavernous, though not quite as wide as it could be because of the subwoofer stuck in the side. Ford's Sync system of voice recognition and activation works well, though as usual it would interrupt my enjoyment of the SIRIUS satellite radio shortly after being fired up by announcing that it was connected to my cell phone. This wore very thin very quickly. The stereo's info display is mounted up at the top of the center stack, near eye level, where it's very convenient. It didn't hurt that my test unit also came with a very nice set of premium-painted Dark Chrome 17 inch aluminum wheels wearing P215/R45 tires. Click here to stream a Ford video about the Focus. But it's a popular niche and in that niche the Odyssey is one of the top units – a very nice vehicle to drive, with good handling and plenty of power and torque. It's such a great vehicle to drive that I nearly forgot it's a minivan. Okay, it isn't quite THAT nice! The Odyssey gets its get up and go from a 3.5 liter V6 rated at 244 horses @ 5700 rpm and 240 lb-ft of torque @ 5000 rpm. That's plenty, unless you want to pull your house from its foundations. Odyssey has good acceleration with which you can pull out to pass with confidence, and highway speeds (and more) are attainable easily. My test unit wore the EX trim level, which includes such "standard" stuff as 16 inch aluminum-alloy wheels, triple zone automatic climate control system with air-filtration system, power sliding doors (with windows that retract most of the way down), and an eight way power adjustable driver's seat. It also comes with an "upgraded" six speaker, 120-watt AM/FM/CD/MP3/WMA audio system with 6-disc in-dash CD changer that's more bassy than it should be and which otherwise is quite ordinary in its audio quality. The front seats are more supportive than my kids have been lately and, though there's no lumbar support, the basic design of the seat feels as if you've already cranked up the lumbar support anyway. The center row features a kind of captain's chairs, but with a little insert between them that can turn them into a bench. It's kind of neat. 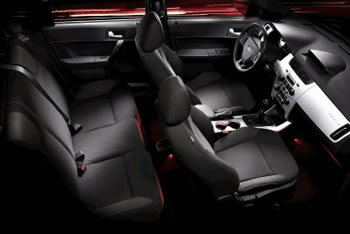 The tumble back rear seat folds into a depression in the floor, which is very tidy and leaves a flat floor for storage. When it's up, it leaves an open bin that's perfect for holding groceries and stuff while helping keep them from sliding around too much. Alas, I had to put my wife's rather heavy suitcase into it, and under circumstances like that the bin was more like a trunk with a nearly hernia-inducing high liftover. Of course I could've just folded down the seat and slid in the suitcase, but that would've made sense. 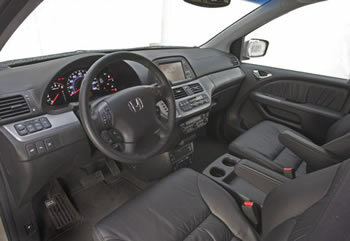 Storage areas abound, including stacked glove compartments that can actually carry more than just gloves, and there's a nice flat tray between the front seats that's perfect for holding the hot lunch you hope won't end up in your lap the first time you turn a tight corner. I had problems with the auxiliary power adapter for my portable SIRIUS satellite radio unit. Honda has mounted it and the AUX audio input perfectly – at the bottom of the center stack – where it's very reachable. Unfortunately, this one appeared to be loose and would cause my portable satellite radio to keep losing power, which meant it would lose the signal – which meant I would lose my tunes and then I'd lose my cool. 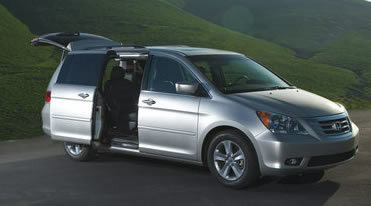 Click here for a Honda video about the Odyssey.